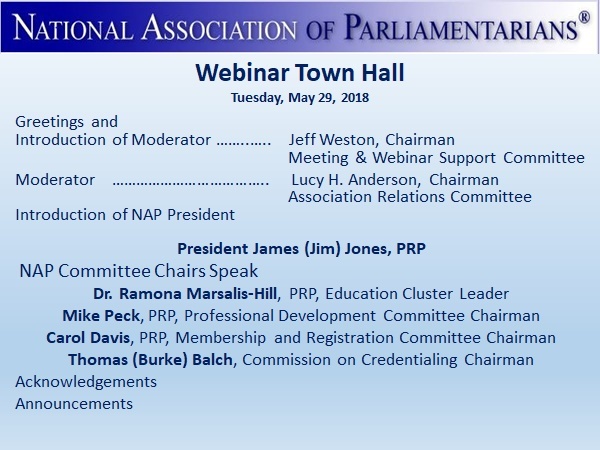 The second 5th Tuesday Town Hall, hosted by the National Association of Parliamentarians (NAP), featured leaders from across the association to discuss the membership structure and highly anticipated changes to the credentialing process. The Town Halls are sponsored by NAP’s Association Relations Committee using Adobe Connect. Presenters included Thomas “Burke” Balch, PRP, Chairman of the Commission on Credentialing; Dr. Ramona M. Hill, PRP, Education Cluster Leader; Mike Peck, PRP, Chairman of the Professional Development Committee; and Carol Johnson Davis, PRP, Chairman of the Membership and Registration Examiners Committee. “One of the most frequent questions I get is about changes to the credentialing process. I’m looking forward to the Credentialing Commission to officially publish their recommendations for the membership to read and digest. Change is often hard; but, I appreciate their hard work in making our association’s credentials even more desirable for parliamentarians and the organizations we serve,” said President Jim Jones. Professional Development Committee Chair, Michael Peck, explained that the committee is focused on developing and administering Professional Development Certification Modules along with developing a team of mentors who will be available to members who seek to obtain or renew their credentials. Professional Registered Parliamentarian (PRP) renewal modules will be offered monthly and credentialed members will be contacted with notice for renewal. The Membership and Registered Examiners Committee was introduced by Chair Carol Johnson Davis, who explained that their mission was to prepare, administer and assess all membership and Registered Parliamentarian (RP) exams. Members, she advised, will be hearing from them soon regarding new study guides and exam options. Thomas “Burke” Balch, Chair of the Commission on Credentialing, presented the differentiation of the knowledge and skill that needs to be demonstrated to earn the RP and PRP certification, and then outlined the three steps in the new Assessment Process. The new process, as Mr. Balch explained, will increase the opportunity for success because it will have more discreet modules whose knowledge areas build on each other. The process will provide feedback for performance improvement after each assessment. This will make the RP credential more meaningful as it will demonstrate real world application of parliamentary knowledge. He addressed current RP and PRP members’ concerns explaining that their credentials are “grandfathered” and the process for retaining their certification remains the same. There will be a two-year “grace period” for those currently in the process of completing their RP and then attaining the PRP under the current process. After that, all new certifications will be through the new process. The Commission’s goal is to provide support so that no one misses the opportunity to earn their credential as the association transitions to the new process. For more information, download the Criteria for Credentialing (2nd preliminary edition) from the Document section of the NAP website. The NAP Board of Directors thanks all who participated and invite all members to participate in the next 5th Tuesday Town Hall, on July 31, 2018, at 7 p.m. (CT). This town hall will feature presentations from the At-Large Directors.